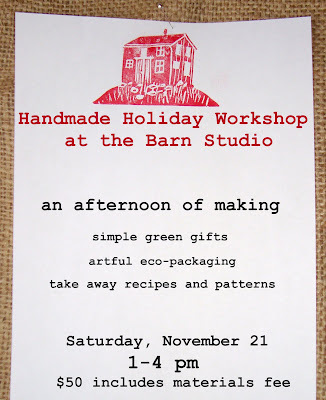 It's time for another workshop at the barn! I get so excited about making presents, wrapping them artfully, and spreading good cheer. Seemed like a class was in order to share my how to's. The focus will be on creating inexpensive, simple gifts... many with materials already on hand: in your recycling bin or maybe your back yard. There will be lots of demonstrations, time for crafting along side old and new friends, inspiration for gifts for all ages. Imagine the smell of baking cookies and mulled cider... festive music in the background. All of this at the beautiful red barn! Oh, it's going to be such fun! I'd love to meet some of my local readers, so I'm letting you in on this first. Next week I'll begin promoting at my near by stomping grounds. E-mail me directly to sign up and/or get more details. I wonder how many of you will be up with me tonight as I finish my son's Halloween costume... putting the final touches on your own costumes? How I love that it's on Saturday this year! Have a wonderful weekend. Why am I at the wrong end of the country? Your Holiday Workshop sounds like a lot of fun, too bad I'm not close. Have a wonderful time, I hope you share some pics after the fact. Have a great weekend. I wish I was closer Maya. That sounds like a wonderful time! Oh, I wish I were a few countries closer!!! Sounds gorgeous! I love this time of year!! I wish that I was a local reader. I hope that it's a great success. Ok (sigh), I can only wait for some pictures of that happy event!Good luck! I'm with the rest of them. I, too, wish I were a local. Please share pics for those of us locationally challenged. yep, i am working on halloween costumes too! glad that i am not alone. Oh....I so with I could come! I bet it is close enough that I could make the drive....I wonder! Although I will be going out of town that day! Darn....I so want to come! Ok, now I really wish I could come to this! It would be so lovely to be there and join in all the fun, alas i am on the other side of the ocean, nevermind the country! Oh that sounds really nice, would love to be there...hope you will share many pictures of the event!! I am new to your blog-- where are you in Upstate NY? We're in the Ithaca area.